After the death of Rene Lalique in 1945 at the end of World War II, the business was continued by his son Marc. Marc changed the product from glass to a heavier lead crystal, changed the company name, and changed the name used for marketing. He also changed the way the products were signed, dropping the R. from the R. Lalique France signature, so that most modern post war signatures read simply: Lalique France*. 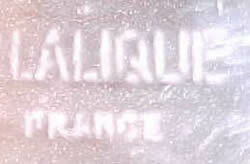 This was later changed to Lalique ® France*. While the signatures Lalique France and Lalique ® France represent the vast majority of all modern crystal Lalique signatures, there are several less common additional modern crystal Lalique signatures which we also illustrate and discuss in addition to the two most often seen. Note: RLalique.com is all about Rene Lalique and the works created during his lifetime. The website does not offer to authenticate,or accept on consignment any of the modern post-war Lalique crystal pieces. A Word, Phrase, Or Symbol That Says It's Not R. Lalique - 6 Examples! One of the easiest modern Lalique signatures to recognize as modern and to differentiate from authentic Rene Lalique (R. Lalique) signatures is our first example, and we picked it for that reason. If your piece bears the form of signature discussed and shown in Example No. 1, or if it contains the registered trademark symbol ® (not the words, just the symbol ®), it is not an authentic pre-war R. Lalique piece**. Examples No. 2 and No. 3 are similarly easy to differentiate because of the inclusion of the word Cristal in the signatures. 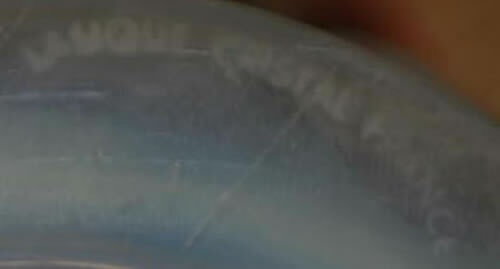 The word Cristal is not found on authentic R. Lalique pieces**. Examples No. 4, No. 5A, and 5B are equally simple to remember. 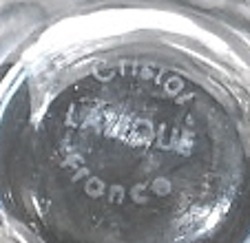 The phrases BOTTLE MADE BY LALIQUE FRANCE, MADE IN FRANCE BY LALIQUE, and MADE IN FRANCE BY LALIQUE ®, are not found on authentic R. Lalique pieces. 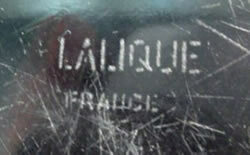 We don't know of any authentic R. Lalique signature containing the phrase "BY LALIQUE". So the modern crystal Lalique signature examples1 thru 5B can be differentiated from R.Lalique signatures simply by a word, phrase or symbol they contain. 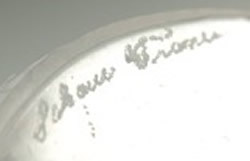 These words and/or the symbol ®, are not found in pre-war (before the death of Rene Lalique) authentic R. Lalique signatures. The "one word indicator" is also true for Example 11 below which illustrates that if a piece has the word CREATION as part of the signature, it is not an authentic R. Lalique piece, and it might not even have been made by the modern Lalique company. 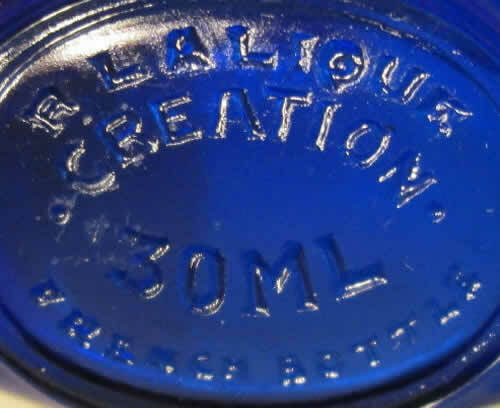 NOTE: Even if the word CREATION is accompanied by the phrase R.LALIQUE it is not an R. Lalique item. It's telling you that the design was originally created by Rene Lallque; it's just giving him credit. But the piece is a modern reproduction that may not have even been manufactured by the modern Lalique Company. Keep in mind that if you have a piece with any of the modern signatures shown here, it only means that the piece is not an authentic R. Lalique piece**. It does not mean your piece is definitely an authentic piece of modern Lalique crystal, only that it is represented as such by that signature. Example No. 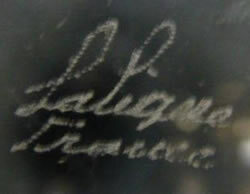 6 below shows the two basic Lalique France signatures from before 1978. For these Lalique France signatures, we don't focus on what is there, such as the ® or a particular word in the first 5 examples, but rather what is not there. 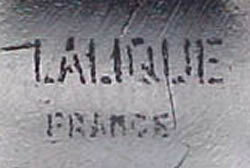 If the word France comes right after or right under the word Lalique in the same inscribed style of the same typeface, and without the leading R. before the word Lalique, these signatures represent the piece to be modern Lalique Crystal made by the modern Lalique company after the death of Rene Lalique. 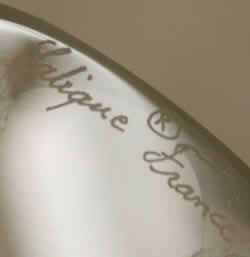 Note in the stencil signatures how the word France below Lalique is often not centered? 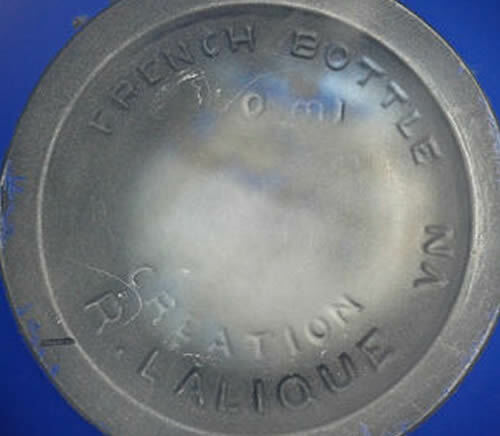 Immediately after the war, when the R. in the stencils was dropped, the word France, which had been centered under R. Lalique, was not moved over to re-center it under the now shorter top line. So it appears off center in many of these block letter stencil signatures. Example No. 7 shows stickers and labels that the modern Lalique company put and continues to put on many of its pieces when new. Many collectors leave these stickers in place, so they may appear even on decades old pieces. If your piece has one of these LALIQUE PARIS, CRISTAL LALIQUE PARIS, or LALIQUE PARFUMS stickers or labels, it is represented as a modern Lalique product and not pre-war R. Lalique. Example No. 8 is a special situation. Impressed 75 Years Linz Jewelists Lalique France celebrating the anniversary of the longtime Dallas retailer. We do not know if these were done by Lalique for Linz, or if Linz had them done after purchasing a batch of Honfleur Cendriers. However from the way the signature is recessed in the crystal, we believe it more likely that these were done by Lalique. Note there likely were at least a hundred or hundreds made at the time, as these appear with some regularity. Example No. 9 is a mid-1950's all capital letters cut signature found on the side of the large decorations Tete De Gazelle and Tete De Cheval. Later examples of Tete De Cheval have been seen with the script Lalique France on the underside. 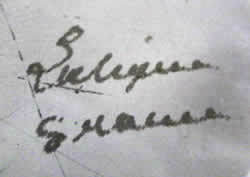 This signature may have been used on other large pieces in the decade after the war. Examples 10 and 11 are special situations. Before we get to the details, this is the take-away: If a signature has the word CREATION in it, the item is not R. Lalique. It's modern! Even if it says R. Lalique, it's still modern! And the kicker: it may not even have been made by the modern Lalique Company! Examples 10 and 11 are all perfume bottles. 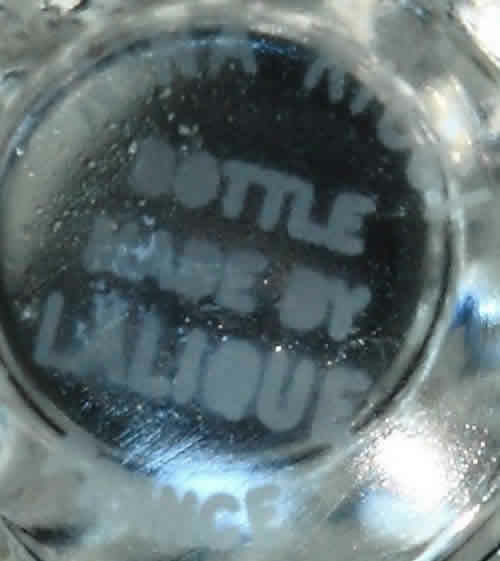 And each has the word CREATION in the signature on the underside of the bottle in addition to either the word LALIQUE or phrase R.LALIQUE. Example No. 10 shows signatures found on modern reproductions of Dans La Nuit Perfume Bottles that bear the signature R. LALIQUE CREATION or CREATION R. LALIQUE. We have at least two examples of what is essentially the same signature; one from the globe shaped blue enameled Stars Dans La Nuit Perfume Bottle and one from a blue glass flask shaped Dans La Nuit Bottle. See the comment that accompanies the photos below for additional information. Example No. 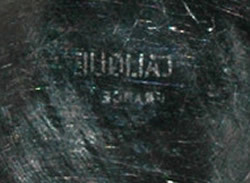 11 Signatures that appear on Molinard De Molinard modern bottles (at least two made by Henry Pochet ) for Molinard. The bottle is a near reproduction of an original Lalique design with a different stopper. We show three different versions of the mark: molded in the glass H.P. MOLINARD CREATION LALIQUE, or MOINARD HP CREATION LALIQUE, and printed on the glass "Flacon creation LALIQUE - made in FRANCE". . Example No. 12 is an example of a modern signature found on the metal back of a crystal brooch. 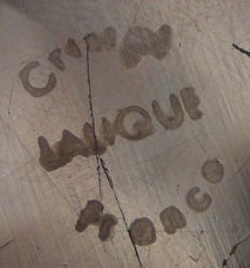 Below are pictured various iterations of the Lalique company signature used since 1978. The ® in between the words Lalique and France is a registered trademark symbol and in 1978 the modern Lalique company began putting that ® in between the words Lalique and France. If your piece of crystal has the signature, Lalique ® France, or contains the registered trademark symbol ® anywhere on the piece, then your piece is not a pre-war authentic R. Lalique glass item made during the lifetime of Rene Lalique**. Instead, it is represented as a modern crystal piece made from 1978 on. Note that the exact form of these signatures can be a little (sometimes a lot) different as you can see from the examples. Some signatures are more legible than others, and on some you can barely make out the ®. It appears they may be signed by hand, which would account for the wide variation in appearance. But, if it's Lalique ® France with the ® symbol anywhere in the signature, it's 1978 forward, and not during the lifetime of Rene Lalique. 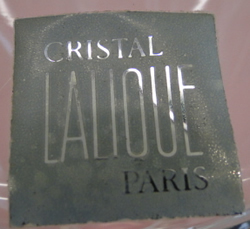 Modern crystal pieces also appear with the signature LALIQUE CRISTAL FRANCE as shown below. Notice the difference in the last two examples having straight lines instead of everything on one arching curve. These signatures are reminders of the time when the modern Lalique company was calling itself, or its products, or both, Cristal Lalique. Pieces with this signature are not found in great numbers however they make regular appearances. If your piece has a signature that includes the word Cristal, it is represented by that signature to be a modern post-war crystal item made by the modern Lalique company after the death of Rene Lalique and it's not an authentic R.Lalique item **. A seldom seen signature, it nonetheless does appear from time to time. The rule is the same for this signature as the previous one. If it has the word Cristal, it's represented as a modern crystal piece made after the death of Rene Lalique and it's not an authentic R. Lalique piece. 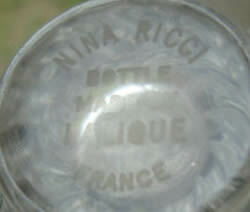 This example signature is taken from the bottom of Nina Ricci perfume bottles. It appears with or without the words Nina Ricci. Note the last signature shows the original label for the bottle (which just covers up blank space). Again we have a signature that's easy to differentiate in two ways. If the signature says Bottle Made By Lalique France, or just Bottle Made By, in front of or after any other kind of Lalique signature, then it's represented to be a modern piece of crystal and it's not an authentic R. Lalique piece. 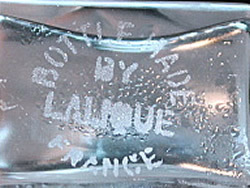 We know of no documented R. Lalique signature that contains the word bottle! 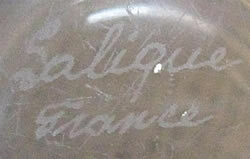 We also do not know of any authentic R. Lalique signature that contains the word BY. 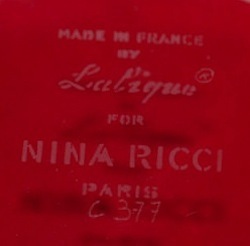 This signature was taken from the bottom of a Nina Ricci Powder Box and it can be identified as a modern crystal signature in two ways. First, while different than Example No. 1, this signature usually is seen with the same registered trademark symbol ®. This symbol is all you need to differentiate it and know that it is represented as a modern Lalique Crystal piece and is not R. Lalique**. 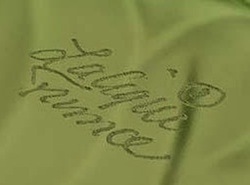 If you see this signature without the registered trademark symbol, you can still differentiate it from pre-war signatures by the phrase Made In France By Lalique! 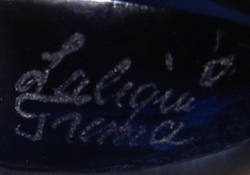 We know of no R. Lalique authentic signature containing the word BY. 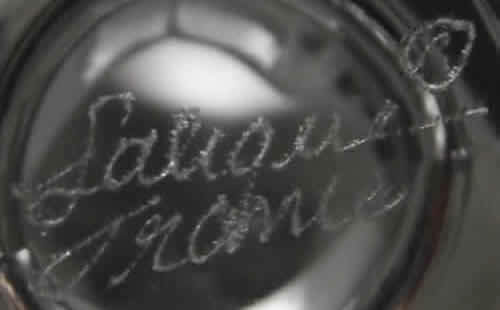 This signature was taken from the bottom of a post-war Dans La Nuit Perfume Bottle for Worth (the bulbous "Stars" bottle) that was labeled for Je Reviens. 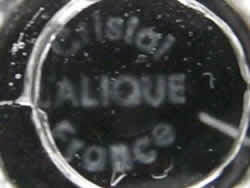 We know of no R. Lalique authentic signature containing the word BY. The most common signature for pre-1978 modern Lalique crystal pieces is Lalique France, and typically it is in one of two forms. 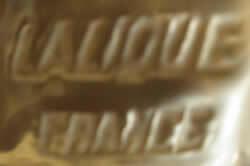 First is a stenciled capital block letters signature, with the word FRANCE next to or underneath the world LALIQUE. FRANCE may also be a slightly smaller size, but the same typeface and style. Also, when France is next to the word Lalique, it does not have to be a perfectly straight line. Some of these signatures had the word placement curved a bit as you can see in one or more of the examples. The second form is the script, sometimes almost scratched-in looking Lalique France with the L in Lalique and the F in France capitalized. Again, France may be next to or under Lalique and as with the first form, the style will be the same for both words. And as with Example No. 1 (the signature with the ® in between the two words), the script signatures have wide ranging appearances due to the pieces likely being signed by hand and not machine. For both these style signatures you focus on what is missing: the leading R. before the word Lalique. If there is no leading R., and the words Lalique and France are as shown with each of the two words in the same style next to each other, or France underneath Lalique, then the piece is represented by the signature to be modern crystal and not pre-war R. Lalique. We are adding sample signatures for this as time permits, so as long as you see this message, these are not complete. 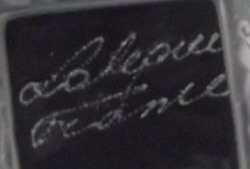 We are currently missing more examples of both styles of signatures where the word France follows Lalique so it's next to it and not below. Modern Lalique Crystal Signature Example #7: CRISTAL LALIQUE PARIS, LALIQUE PARIS, LALIQUE PARFUMS stickers and labels put on modern crystal. 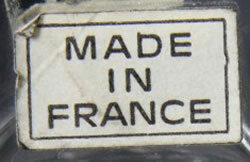 Many modern pieces (and not any authentic R. Lalique pieces) were also sold with the rectangular sticker MADE IN FRANCE as shown. Also many modern pieces have the model number shown on a plain white sticker such as the one pictured with the number 11746. 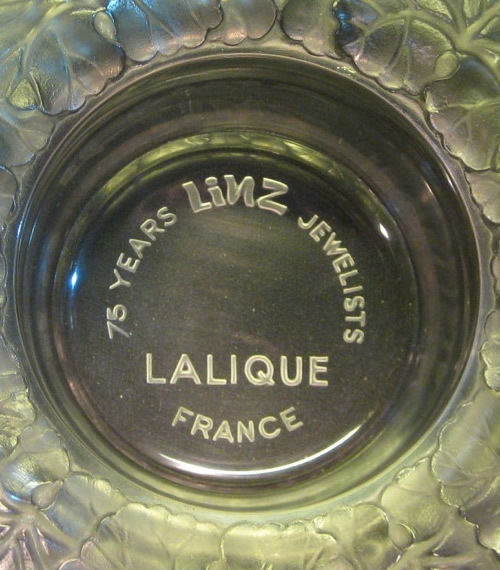 Modern Lalique Crystal Signature Example #8: 75 YEARS LiNZ Jewelists LALIQUE FRANCE on Honfleur Cendrier for a Dallas Texas Jeweler. Modern Lalique Crystal Signature Example #9: LALIQUE cut signature found on the large decorative motif Tete De Gazelle followed by a cut signture on a large double doves perfume bottle for Nina Ricci. Creation R.Lalique Modern Signature Example #10: Molded R. LALIQUE CREATION followed by the bottle size in ML and FRENCH BOTTLE or the reverse FRENCH BOTTLE 350 ML CREATION R. LALIQUE. There bottles are modern reproductions of original Rene Lalique designs, though it is possible they were not made by the modern Lalique Company. The two examples are both from Worth Dans La Nuit bottles, one ball shaped (Stars), one flask shaped. Note the Stars bottle (the first photo) also has a molded VN. Input from readers about these bottles and signatures would be greatly appreciated. Creation Lalique Modern Signature Example #11: Molded H.P. MOLINARD CREATION LALIQUE or MOLINARD H.P. CREATION LALIQUE. 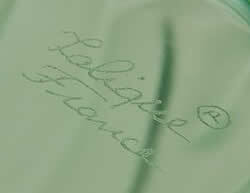 also a printed example "Flacon creation LALIQUE - made in France". 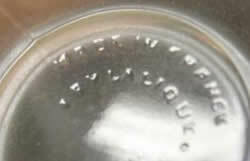 The first two molded signatures indicate with the H.P. that the bottles were made by Henri Pochet. All of these appear on the bottle for Molinard De Molinard. This bottle is a reproduction with a different stopper of a Lalique design. Jewelry Lalique Modern Signature Example #12: This example is from the back of a metal backed crystal modern brooch. * There are a few exceptions to this dropping of the R in the modern (after the death of Rene Lalique) pieces as a few old pre-war molds with the old R in front signature were used after Lalique's death until the old mold was replaced. So some modern pieces do have the molded R. Lalique signature, but they were also inscribed Lalique France to indicate that they are modern crystal made after Lalique died. 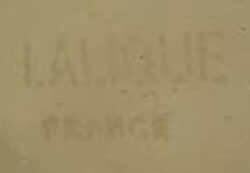 Also as noted in Example 11 above, there are later reproductions where the molded R. Lalique is accompanied by the word Creation and there is no Lalique France inscribed. It is possible that these Creation bottles were not even made by the modern Lalique Company. 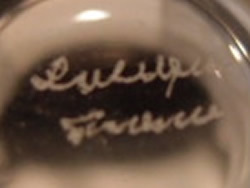 If you want to know more about original authentic pre-war Rene Lalique signatures, review the R.Lalique Signature page here at RLalique.com. Also, it is possible, though rare, to have an authentic R. Lalique pre-war piece that only has the words Lalique and France on it. But, this is very rare, and the words would not form a signature. 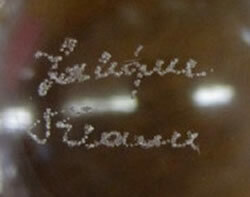 Lalique and France would not be written together as one signature like the ones shown in photos in Example No. 6, and the two words would likely be in different print (block or script or whatever) so that the two words could not be confused with a signature. Of course, if you have a piece with this type of marking, Lalique in one place, and France in a different one, and you are in doubt, you can submit the piece for authentication to be sure. 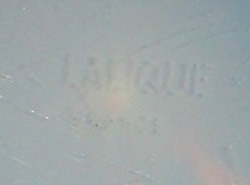 Finally there is a known Lalique France signature in the mold as part of the glass which appears on the front of the neck of pre-war authentic R. Lalique Tete De Coq Rooster Head car mascots (as well as on some post-war examples of this same model). It could not be confused when you look at it, with any of the modern crystal signatures as it is intaglio molded (the letters go into the glass below the surface) and it's not inscribed or stenciled. 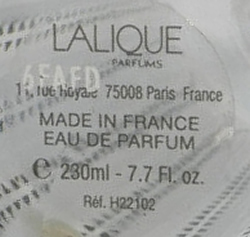 However, it does say Lalique France so we mention it here as an exception to the rule in the preceding comment. ** It is extremely unlikely that anyone would forge any of the modern crystal Lalique ® France, Lalique Cristal France, Bottle Made by Lalique France, Made In France By Lalique ®, or Lalique France signatures on an authentic Rene Lalique piece. We have never see it done.